Bryan Charnley was a British artist whose popular series, “The Self Portrait Series” captured and reflected the effects of Schizophrenia. Bryan Charnley’s Self Portrait Series intended to portray the ‘humaneness’ of the sufferer and to depict the traumatic experience of the victim through a universally common visual metaphors. Bryan John Charnley was born on 20th September 1949 in Stockton on Tees. He is one of the twins. He stayed with his parents in London, Chislehurst in Kent, Cranfield, where his father worked as a Senior Lecturer, and finally in Bromham near Bedford. He was a talented painter right from his young age. In the summer of 1968, aged 18, he suffered his first nervous breakdown, but he was able to complete a pre-diploma course in art at Leicester school of art later that year. He gained admission at Central School of Art and Design in Holborn, London in 1969 but was not able to complete the course due to another nervous breakdown which was later diagnosed as acute schizophrenia. He lived with his parents for six years from 1971-77 undergoing various treatments including ECT (ElectroConvulsive Therapy or Electroshock Therapy). 1978 saw Charnley shifting to his own accommodation in Bedford. He recommenced painting determined to succeed as an artist. This period saw him flirting with prevalent styles in the art world. 1982 saw a change in Charnley’s focus, from flowers, he switched to Schizophrenia, he began to use schizophrenia as his subject. This was because he was greatly influenced by the (collection of) paintings at the Bethlem Museum of the Mind (then Bethlem Royal Hospital). 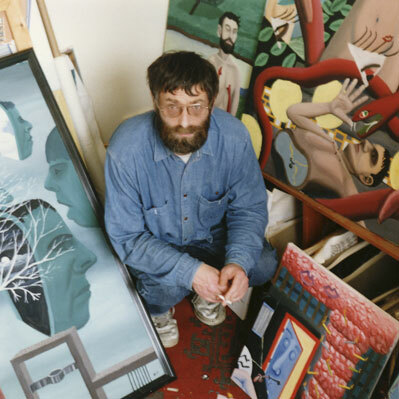 Bethlem Royal Hospital purchased four of his paintings for their permanent collection in 1984. Charnley had a solo exhibition at the Dryden Street Gallery, Covent Garden in London 1989 and he also exhibited two of his paintings, Angel, and Straitjacket at ‘Visions’ exhibition at the Royal College of Art in 1990. The little success and the recognition he obtained as a painter were outweighed by his daily struggles with his illness and the strong medication he was prescribed to counter it. His final work Self Portrait series was painted as he experimented with varying dosages of his medication – Depixol and Tryptisol. His last 17 portraits graphically display his steady decline and the terrible suffering he endured as he cut/played with his dosage. Charnley committed suicide in 1991 with his final self-portrait still on the easel. All paintings are oil on canvas and measure 20 x 20 inches (51 x 51 cm.). Marjorie Wallace who intended to write an article about his Self Portrait Series encouraged him to keep a diary which would help to explain the imagery. The Self Portrait Series was exhibited at the National Portrait Gallery in 1995. Conventional portrait painted in two sittings. Is it a good likeness? Drug dosage was two 3 mg. tablets of Depixol daily plus two 25 mg. Tryptisol. I was sleeping a lot. 11th to 16th April 1991. I had originally had the idea for a series of self portraits from Louis Wain’s series of portraits of cats that changed strangely as he became more and more psychotic. They seemed to show a disintegrating ego. I expected something similar, that is the reliance on a sort of hallucinatory geometry but instead found that I was almost completely unable to concentrate so the painting takes on the crudeness of bad graffiti. I ascribe this to the fact that Depixol strengthens concentration and so its removal means that the power of concentration breaks down. However I would mention that this, as in Louis Wain’s case was not my problem when I originally became ill but seems to have resulted from Depixol dependency. Still on one tablet of Depixol plus sleeping pills. I had come to the conclusion that most people around me had some extra sensory perception ability which gave them access to my mind. In this respect I was like blind man. Hence the crosses on the eyes. They also let me know verbally what they had pi ked up from my thoughts. I was like a dumb man in this respect and hence the cross over the mouth. The crossed out dates are because I was becoming obsessed that I had taken two sittings rather than one on the first self portrait. The central text reads: The cards are no good that I’m holding unless they are from another world This is a line from Series of Dreams by Bob Dylan, the last track on The Bootleg Series, Volumes I-3. There was no commentary from Bryan Charnley for his two last portraits. It is assumed that these two colors (Yellow and Red) is indicative of his acute mental anguish. Previous article 24 Fun Facts About The Movie ‘DeadPool’ That Every Fan Must Know! Next article 20 Popular Myths Debunked: “Facts” You’ve Always Believed That Simply Aren’t True!